President Tayyip Erdoğan said recordings related to the killing of Jamal Khashoggi, which Turkey has shared with Western allies, are "appalling" and shocked a Saudi intelligence officer who listened to them, Turkish media reported on Tuesday. Khashoggi, a critic of de facto Saudi ruler Prince Mohammed bin Salman, was killed in Saudi Arabia's Istanbul consulate last month in a hit which Erdoğan says was ordered at the "highest levels" of the Saudi government. Erdoğan told reporters on his plane returning from a weekend visit to France that he discussed the Saudi journalist's killing with the U.S., French and German leaders at dinner in Paris. British foreign made clear to Saudi Arabian officials that those responsible for Jamal Khashoggi’s murder must be held accountable, Prime Minister Theresa May said Monday.May also reiterated the U.K.’s calls for a transparent investigation into the killing.“As we seek to protect and advance our common security, it is vital that we and our partners in the international community demonstrate our common adherence to the rule of law,” May said in an address to the annual Lord Mayor’s Banquet. “We have seen this most recently in the terrible murder of Jamal Khashoggi. “And as the foreign secretary made clear again in his visit to Riyadh today, there must be a transparent and credible investigation and those responsible must be held to account.”Khashoggi murder recording may implicate Saudi princeForeign Secretary Jeremy Hunt on Monday visited Saudi Arabia and met with King Salman bin Abdulaziz, Crown Prince Mohammed bin Salman and Foreign Minister Adel al-Jubeir.It is “unacceptable” the full circumstances behind Jamal Khashoggi's murder still remain unclear, Hunt said Sunday prior to his visit to Riyadh.He urged Saudi officials to fully cooperate with Turkey to enlighten what happened to Khashoggi.Hunt is the first U.K. minister to have visited Saudi Arabia since the murder of the Saudi journalist last month, a Foreign Office statement said.“He will use his meetings to make clear the importance of Saudi Arabia cooperating with Turkey to conduct a full and credible investigation into Mr. Khashoggi’s death,” it said. "The recordings are really appalling. Indeed when the Saudi intelligence officer listened to the recordings he was so shocked he said: 'This one must have taken heroin, only someone who takes who heroin would do this," he added. Erdoğan said it was clear the murder was planned and that the order came from the top level of Saudi authorities but that he could not think such a thing of King Salman, for whom he has 'limitless respect'. "The crown prince says 'I will clarify the matter, I will do what is necessary'. We are waiting patiently," Erdoğan said, adding that the perpetrators of the killing were among 18 suspects detained in Saudi Arabia. A telephone call between an alleged killer of Jamal Khashoggi and his superior may implicate Saudi crown prince in the murder of the the journalist, the New York Times reported Monday. "A member of the kill team instructed a superior over the phone to 'tell your boss,' believed to be Crown Prince Mohammed bin Salman, that the operatives had carried out their mission," said the newspaper.It quoted three people familiar with a recording of Khashoggi’s murder collected by Turkish intelligence, which "is seen by intelligence officials as some of the strongest evidence" linking bin Salman to Khashoggi’s killing. "While the prince was not mentioned by name, American intelligence officials believe 'your boss' was a reference to Prince Mohammed," it said.Maher Abdulaziz Mutreb, one of 15 Saudis in the hit squad sent to Istanbul to confront Khashoggi, made the telephone call and spoke in Arabic, according to the report.The newspaper said Turkish intelligence told American officials it believes Mutreb was speaking to one of the prince’s aides.Germany receives recordings on Khashoggi from TurkeyTrudeau: Canada has heard Turkish recordings on Khashoggi's killing"While translations of the Arabic may differ, those briefed on the call said Mr. Mutreb also said to the aide words to the effect of 'the deed was done'," said the Times.The report also quoted Turkish officials as saying the audio does not "conclusively implicate Prince Mohammed. ""American intelligence and other government officials have cautioned that however compelling the recording may be, it is still not irrefutable evidence of his involvement in the death of Mr. Khashoggi," it said.Khashoggi, a Saudi national and columnist for The Washington Post, was killed Oct. 2 inside the Saudi Consulate in Istanbul.After weeks of denying involvement, the kingdom admitted Khashoggi had been killed at the consulate but claimed the Saudi royal family had no prior knowledge of a plot to murder him.So far, 18 people, including security officers, have been arrested in Saudi Arabia in connection with the murder. Erdoğan has not given details of the contents of the tapes but two sources with knowledge of the issue have told Reuters that Turkey has several audio recordings. Regarding his conversation with U.S. President Donald Trump, Erdoğan said they discussed the Halkbank issue and agreed to resume talks to resolve it. A U.S. court in May jailed a Halkbank executive for helping Tehran get round U.S. sanctions. Halkbank denies any wrongdoing and Erdoğan has condemned the court case as a political attack on his government. Erdoğan said he brought up the issue of Halkbank again, which prompted the same response from Trump, who said he personally gave orders to the Secretary of Treasury to deal with the issue. “I will give instructions the moment I get back. I thought it was resolved. Why is it taking so long?” Trump said, according to Erdoğan. 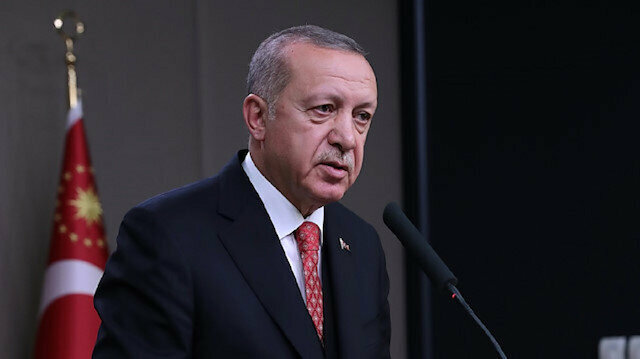 Addressing questions on Syria, Erdoğan praised Turkey’s efforts in Idlib which helped avert disaster in the heavily-populated opposition stronghold. Ankara and Moscow signed a memorandum of understanding calling for the “stabilization” of Idlib's de-escalation zone, in which acts of aggression are expressly prohibited. Erdoğan has repeatedly vowed to eradicate the east of the Euphrates River in Syria from terrorists of the Kurdistan Workers’ Party (PKK)’s Syrian affiliate, the YPG.